(Click picture to see larger image.) Tour begins in the loading dock area. (Click picture to see larger image.) A visit is made to the work area in the Data Center staffed by NCO. (Click picture to see larger image.) Sinks in bathrooms are equipped with faucets that are hands free. (Click picture to see larger image.) Design in terrazzo floor in atrium. (Click picture to see larger image.) Lights installed in floating stairway in atrium. (Click picture to see larger image.) Inside of elevator. (Click picture to see larger image.) Progress in the deli. (Click picture to see larger image.) Another view of the deli. (Click picture to see larger image.) Patio outside of deli. Door to deli is on the left. Grey wall in background is the parking garage. (Click picture to see larger image.) Atrium very close to completion. (Click picture to see larger image.) Conference rooms in conference center showing installation of movable walls. (Click picture to see larger image.) View of auditorium from the rear. Stage nearing completion. (Click picture to see larger image.) View of main entrance. (Click picture to see larger image.) Vehicle entrance to right and outdoor parking. ESSIC building is in the background. (Click picture to see larger image.) Pedestrian entrance/exit to parking garage. (Click picture to see larger image.) South facing office area on the second floor. (Click picture to see larger image.) Inside of a copy room on the second floor. (Click picture to see larger image.) Interior of conference room on second floor. (Click picture to see larger image.) A large conference room. Square holes on floor will provide electrical connections. (Click picture to see larger image.) Landscaped rear of building. Parking garage in background. (Click picture to see larger image.) Area that will house the Marine Modeling and Analysis Branch of EMC on the second floor. (Click picture to see larger image.) Media Center on 4th floor. (Click picture to see larger image.) Construction continues in the fourth floor operational area. (Click picture to see larger image.) Conference rooms line the south side of the atrium on floors 2, 3, and 4. (Click picture to see larger image.) View into the NCEP Office of the Director on the 4th floor. (Click picture to see larger image.) Railing posts installed on floating stairway in atrium. (Click picture to see larger image.) Glass panels ready for installation on the floating atrium stairway. 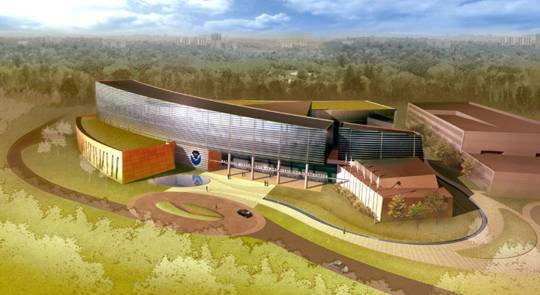 The NOAA Center for Weather and Climate Prediction is located on a 50-acre section of the University of Maryland's M-Square Research and Technology Park. Tenants include approximately 800 employees of NOAA's National Weather Service, National Environmental Satellite, Data and Information Service, and Office of Oceanic and Atmospheric Research. The project was completed in the Fall of 2012.